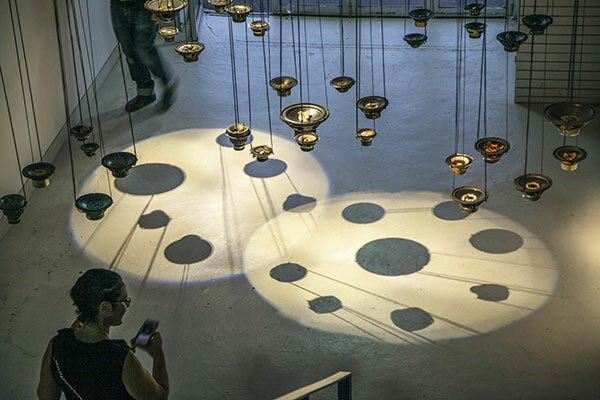 materia vibrante (sonora) is a the most recent manifestation of an electroacoustic installation developed by Ferracin during a 2015 Largo das Artes’ residency in Rio de Janeiro, Brazil. It is an investigation into, and intuitive expression of, the notion of Universal Consciousness, learning from and bridging to human cultures that remain in deep contact with indigenous ecosystems through their animist cosmologies wherein the originating energy of life-mind resides and is manifest in all things and phenomena. This project was inspired by Ferracin‘s exposure to shamanic rites of Brazil’s indigenous peoples and the contemporary multicultural ambience of Rio de Janeiro. Later, back in Australia, she travelled to Arnhem Land and visited Bawaka and Bukudal lands to directly experience Yolŋu Aboriginal understanding of our universe as an ever negotiated system of balance between Yirritja (water) and Dhuwa (earth) moiety entities. At Articulate, materia vibrante (sonora) evolves through different states. 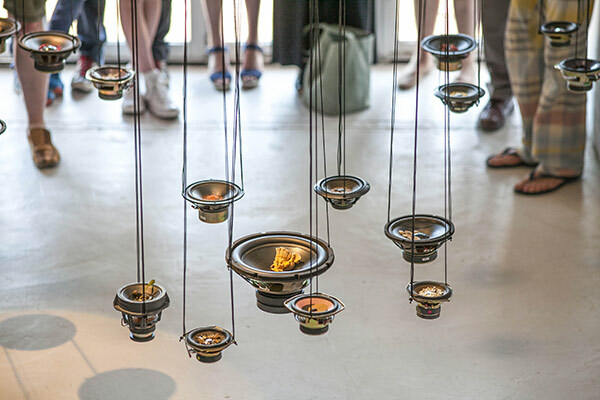 Comprising an array of 32 suspended speaker cones hanging at navel height in loose clusters, the work begins as a still, silent, empty sculptural presence imbued with potential. 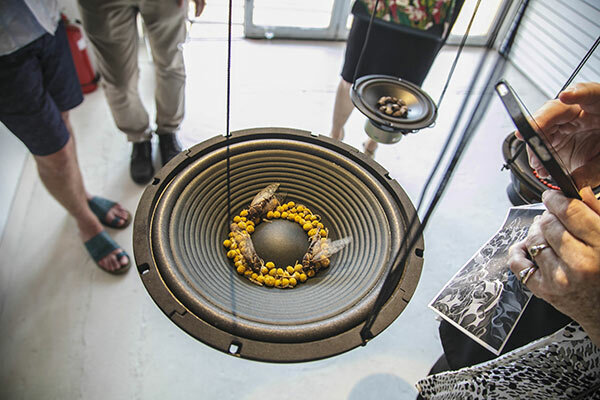 At the social gathering of the opening night, in the company of visitor witnesses, the installation is performatively activated by the simultaneous introduction of immaterial electronic sound signals and diverse material elements collected by the artist from a variety of ecological sources. Many were collected on her daily walks through suburban streets and nearby bushland, noticing and gathering the changing seasonal offerings. Ferracin and two assistants gradually add handful samples - of pollen, sand, earth, water, pumice, feathers, shells, lichens, seeds, leaves - directly onto the exposed, suspended speaker cones. Different materials are carefully deposited into each of the 32 sonic receptacles. 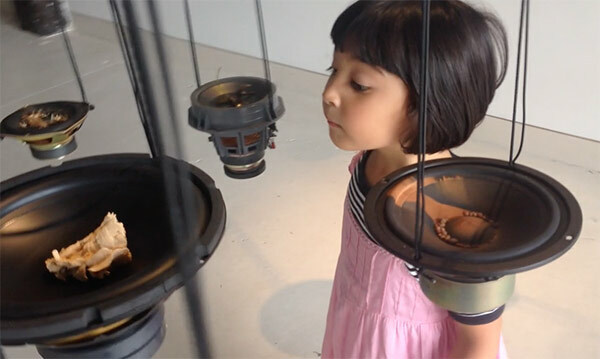 Ferracin has experimented in her studio to identify harmonic resonance relationships between specific materials, sounds and speaker cones. The artist’s actions complete this sculptural system of techno- ecology synthesis. 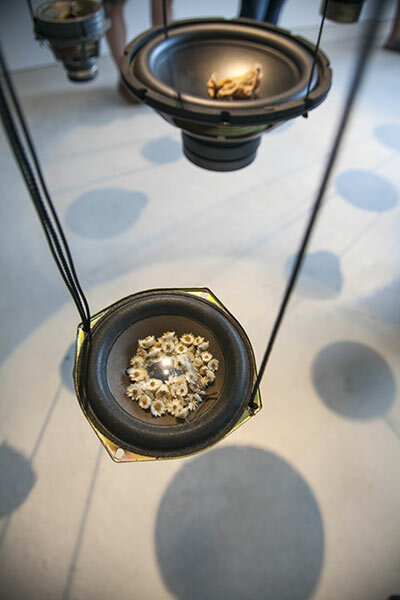 Her multi-track audio composition delivers selected sounds to each speaker, causing the introduced materials to vibrate, shake, tremble, dance.